SMS Campaigns enable you to send text campaigns via SMS to mobile phones. Select the My SMS option from the SMS Menu. This will open the Send out SMS Campaign Window. Campaign Title—the title of the campaign. This is just for reference. The recipients of the campaign will never see this title. Sender ID—use the drop-down to select the Sender ID. This is the “from” name that recipients will see when they receive the SMS message(s). List or Segment—use the drop-down to select a list or segment. Once you have selected the recipients, you can also add new subscribers by clicking on the Add Subscribers Link. This will open a new browser window or tab of the Import Subscribers Screen. You can also add additional lists and segments to include in the campaign by clicking on the + Icon or remove them by clicking on the – icon. Note: You can only remove segments or lists when you have added more than 1. Your SMS campaign must include AT LEAST 1 list or segment. 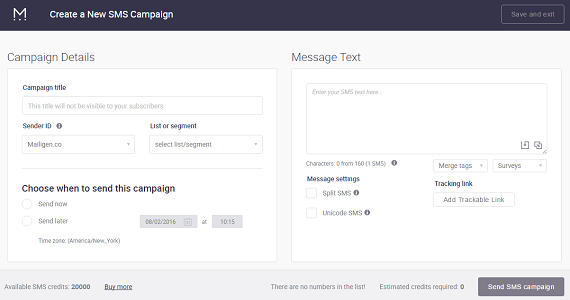 When you select a list or segment, platform will automatically calculate the estimated SMS credits required to send the campaign (based on the total number of contacts). The blue number indicates subscribers that have a correct phone and will be included in the SMS campaign. The red number indicates subscribers that have an invalid number and will not be sent the SMS campaign. You can click the Campaign recupients Link to see the numbers that will be added. To buy more SMS credits, click the Buy more link. This will open a new browser window or tab through which you can buy more SMS credits. For more information about SMS credits, see the support topic “Purchasing and Calculating SMS Credits.”. From scratch—you can also enter text into the Message Area by typing it and combining it with Merge Tags and Survey Links. 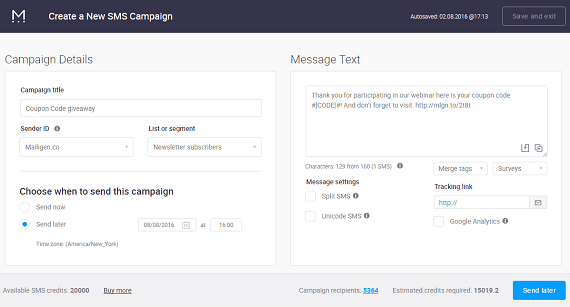 You can also save what you create in the Message Text as SMS Campaign Template by clicking on the Save as New SMS Template Icon. Note: You must already have a survey created to select one by using the drop-down menu. If you do select a survey, a shortened link will be inserted into the Message Text area. Note: Your SMS message is limited by the number of characters. For a regular SMS, the maximum length is 160. For a split SMS, it is 153 characters. For a Unicode SMS, it is 70 characters. Platform keeps a running character count right below the Add a Link text field. Add a Merge Tag—you can easily add any merge tags using the drop-down. These merge tags are the tags available from the segments and lists you have selected. Surveys—you can add a link to a survey you have created by using the appropriate drop-down. This will add a shortened link to the survey in your text message. Google Analytics—check the box to include this campaign in your Google Analytics. When you check the box, you will be prompted to enter a campaign name that can be uniquely tracked within Google Analytics. Split SMS—check this box to send your message text over multiple, consecutive SMS messages. This will reduce the total maximum characters per text message to 153. Unicode SMS—check this box to have your text message sent in Unicode formatting. This is ideal when you need to use characters that are outside the GSM 7-bit alphabet. This will reduce the total maximum characters per text message to 70. Note: Autosave is available when you are creating SMS campaign. A message is saved every 20 seconds. Send Now—select this option to send the SMS campaign after you click the Send Button. Send Later—check this box to send the SMS campaign at a later date. Click the Calendar Icon to set the current date to today and the current time to now. You can adjust the date by using the arrows in the calendar to navigate to the appropriate month and year. You can adjust the time by using the Hour and Minute sliders. If you need, you can change your timezone by clicking on the Change Time Zone Link which will reveal a drop down from which you can select your timezone. When you are finished, click the Send Later Button to schedule the SMS campaign.